This is a Chinese name; the family name is Wu (Go). Wu Qingyuan (Chinese: 吳清源)[notes 2] (June 12, 1914 – November 30, 2014), better known by the Japanese pronunciation of his name, Go Seigen (ご せいげん), was a Chinese-born Japanese master of the game of Go. He is considered by many players to have been the greatest Go player in the 20th century. Born on June 12, 1914 in Minhou County, Fujian Province, southeast China, Go Seigen did not start learning go until he was nine, a relatively late age for a professional (Honinbo Dosaku first learned go at seven and Honinbo Shusaku before he was six). His father, who had taken go lessons from Honinbo Shuho while studying in Japan, was responsible for introducing him to the game. Go Seigen quickly excelled and soon became known as a Go [notes 3] prodigy. 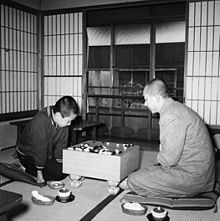 By the time he was 12, less than three years after first learning the game, he was already of professional strength, as evidenced by his games against the visiting Japanese player Iwamoto Kaoru, 6p in 1926. The next year, he was able to reach a draw in a two-game match against another Japanese professional, Inoue Kohei, 5p. In 1928, still only 14 years old, he twice defeated Hashimoto Utaro, 4p. Go Seigen's reputation spread to Japan, then the leading Go powerhouse, and a movement was started there to bring him to Japan. He subsequently immigrated to Japan in 1928, at the invitation of Baron Kihachiro Okura and Inukai Tsuyoshi (later prime minister of Japan), and embarked on a professional career. He was tutored by Segoe Kensaku, the same teacher as Hashimoto Utaro and Cho Hunhyun. Starting in 1939, Go Seigen began a spectacular series of Jubango matches against other top players of the day. It was through these matches that Go Seigen convincingly demonstrated an overwhelming dominance over his contemporaries. 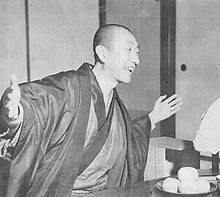 Go Seigen had only two formal disciples — Rin Kaiho, Honorary Tengen and Rui Naiwei, who was the strongest female go player ever and won open Guksu title. In the 1940s, Go Seigen became involved in the Jiu (璽宇) shinshūkyō, which sprouted out of Oomoto. After the Jikoson incident in 1947, he and his wife distanced themselves from the cult. In November of 1948, both had formally left. After his retirement, Go Seigen remained active in the Go community by teaching, writing, and promoting the game around the world. He authored a number of books on go, some of which include A Way of Play for the 21st Century, Modern Joseki Application Dictionary, and Fuseki and Middle-game Attack and Defense. Go Seigen held study sessions with other professional players such as O Rissei, Michael Redmond, Rui Naiwei, and others. In 1987, Go Seigen was awarded the Grand Cordon of the Order of the Rising Sun, 3rd Class, Gold Rays with Neck Ribbon, for his lifetime contributions to Go. In 1999 Mr. Teramoto, Go Seigen's manager, told go writer Pieter Mioch "He [Go Seigen] is one of three Go players who will still be notable several hundred years from now. The other two are Dosaku (1645 – 1702) and Shusaku (1829 – 1862)." Go Seigen is commonly considered to be among the best to have ever played go, and is frequently deemed to have been the best player of the 20th century. He dominated professional go for more than a quarter of a century. He maintained a brilliant match record and successively defeated all the leading players of the day in a series of notable jubango (contest between two players consisting of ten games), even forcing them down to handicaps. Some of the defeated were Kitani Minoru, Karigane Junichi, Hashimoto Utaro, Iwamoto Kaoru, Fujisawa Hosai, Sakata Eio, and Takagawa Kaku. Go lost just one jubango, and that was against Fujisawa Hosai. However, the match was played with Fujisawa taking the josen handicap throughout, and Fujisawa only managed to win with a score of 6 to 4. Some ten years later, Go Seigen took revenge on Fujisawa by beating him in two consecutive jubango with lopsided scores of 7-2 and 5-1 respectively. One must note that these jubango matches were all played without komi, and indeed the same applied to the vast majority of games Go Seigen played during his career. Go Seigen won the Oteai six times, and won a special Nihon Ki-in championship tournament in 1933. The match ended with Honinbo Shusai winning by two points. However, his victory was surrounded by controversies. At the time of the match, the tradition dictated that the player holding white had the right to adjourn the game at any time, and there was no sealing of moves before adjournment. This meant that Shusai, being the nominally stronger player and thus holding white, could adjourn the match whenever it was his turn to move and continue deliberating at home before the match resumed. Shusai shamelessly abused this privilege by adjourning the game more than a dozen times, all at his turn to play. For instance, on the eighth day of the match, Shusai played first, and Go Seigen replied within two minutes, Shusai then thought for three and a half hours, only to adjourn the game. It was no secret that Shusai, during adjournments, discussed and studied the game with his students to come up with the best moves. Go Seigen was therefore put into an especially adverse position for having to take on the entire Honinbo establishment. Shusai had been trailing all throughout the match when, on the 13th day of the game, he made a brilliant move (W160) that in a single stroke brought him back into the game and guaranteed his victory. However, it was widely rumored that it was not Shusai but one of his students - Maeda Nobuaki - who authored this ingenious move. Even Maeda himself hinted that this move was indeed his idea. Years later, when presented with the opportunities to debunk this rumor, he neither confirmed nor denied it. The game became known as the game of the century. In 2006, Chinese director Tian Zhuangzhuang made an award-winning biopic film about him entitled The Go Master, starring Taiwanese actor Chang Chen as Go Seigen. In another film, An Unfinished Game, a 1982 Sino-Japanese co-production, the life of one of the characters has similarities with the life of Go Seigen. The film marked the 10th anniversary of the establishment of diplomatic ties between Japan and the People's Republic of China. This film is informally known as The Go Masters in the United States, and also is award-winning. ^ Minhou County still exists but his birthplace is now located in Gulou District, Fuzhou. ^ His original name was Wu Quan (Chinese: 吳泉). A new name, Qing Yuan, was created for him based on his old name (Quan means "spring, fountain" and Qing Yuan means "clear and pure source of water"). ^ After days and nights, the shape of his left index finger changed, bending backwards. At that time, probably no other Chinese player was studying Japanese game records as deeply as he. ^ "吴清源父母喜结连理：红娘是民国大总统徐世昌". Fuzhou Evening News. 22 November 2017. ^ a b c d e f g h "Analysed Games of Go Seigen" (PDF). Retrieved 1 December 2014. ^ "Legendary Go grandmaster Wu Qingyuan dies at 100". South China Morning Post. 1 December 2014.